As many Aussie girls would already know, Ulta3 recently released a candy cane full of new shades. The candy cane only costs $12.95 and it has 10 polishes in it. 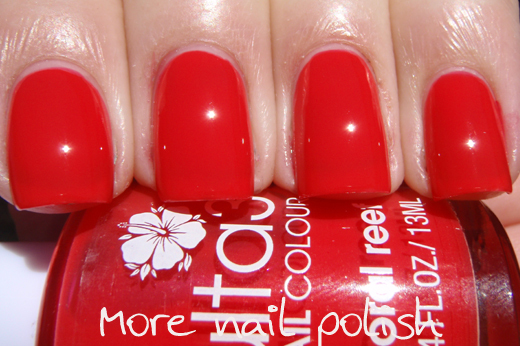 Which is truly unbelievable value for nail polish here in Australia. 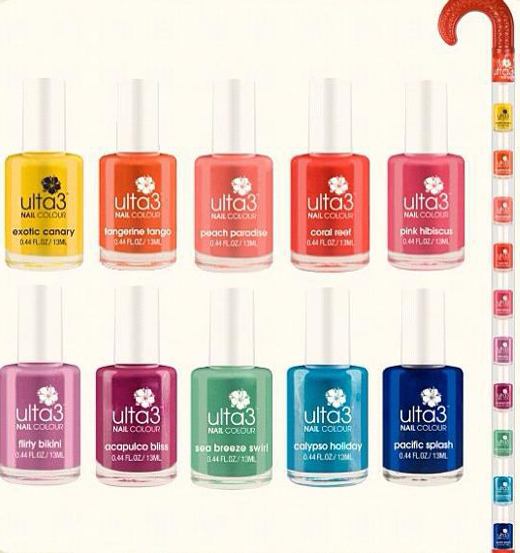 If you are looking for a local stockist, check out the Ulta3 Stockist Locator app on their Facebook page. Today I have part one of my swatches, the top row of five colours. Photo credit: Not exactly sure, taken from Aussie nails - please let me know if its yours. 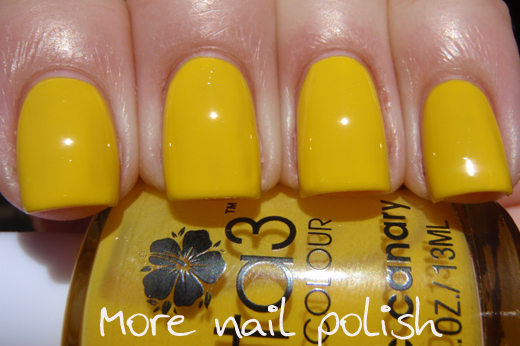 Exotic Canary - 4 coats + Seche Vite top coat. Bright yellow creme, but not neon. 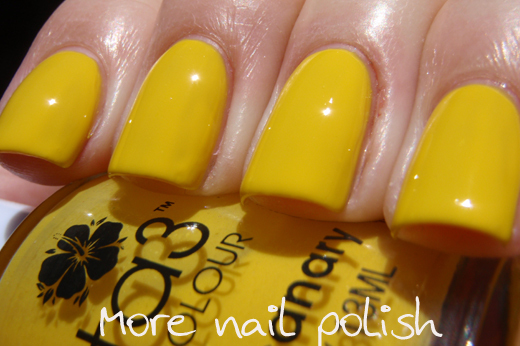 It's definitely tweety bird yellow, so the name certainly suits the polish. A slightly darker yellow than frangipani. Tangerine Tango - 3 coats + Seche Vite. A very bright orange creme. More orange than carrot top. 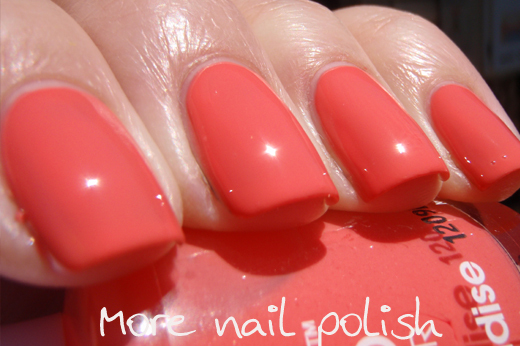 Peach Paradise - 3 coats + Seche Vite. A salmon pink coral shade. Quite similar to the made in Australia version of watermelon, but a little lighter. 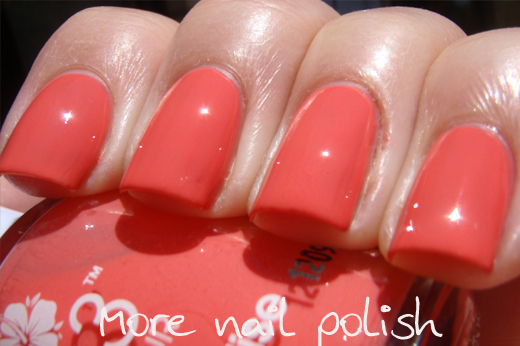 Coral reef - 3 coats + Seche Vite. 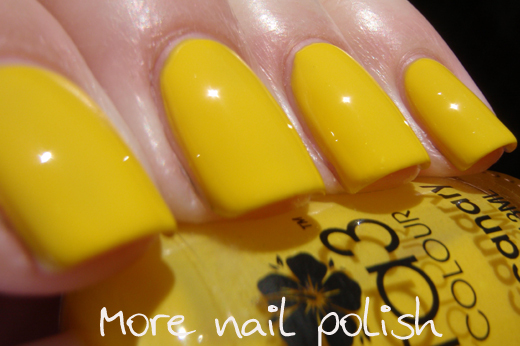 Bright yellow toned red creme. Looks similar to the made in Australia version of Scarlet. Still some tiny visible nail line at three coats, which means maybe this is a bit jelly like. 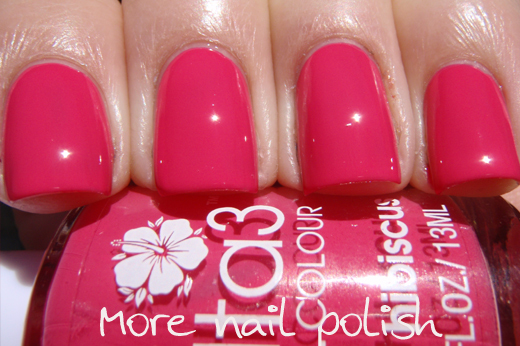 Pink Hibiscus - 2 coats + Seche vite. Bright pink creme. 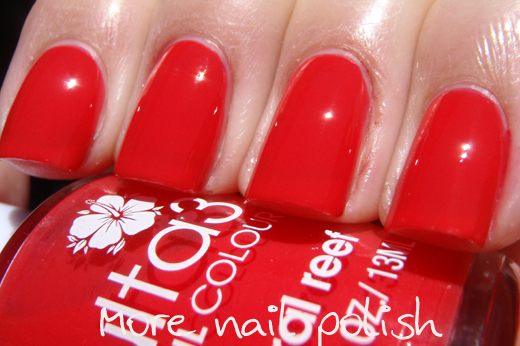 There are quite of lot of Ulta3 pinks that are similar to this shade, Party Shoes and Bo Peep would be the closest. Unlike many of the new made in PRC Ulta3s, these were all quite thin and not really opaque at all. Most needed three coats and the yellow needed 4 coats. But having said that, this year's candy cane is so much better than last years, simply because it actually contains new shades. Last years was just a fancy christmas way of selling 10 existing colours. Amazing quality for such a bargain. Gorgeous swatches!!! These really are a bargain. I hope I can find one of these! Thanks for letting us know about them! The peach is beaaaauuuuutiful. Your nails are so well done! Oh wow, that is so affordable! Converted to Philippine pesos, the whole collection is a little more/less than a bottle of OPI Nail Polish! :) How I wish I can find that one here in the Philippines, too! Of all, I love the Pink Hibiscus.